Easter will very soon be upon us, so I thought I’d better not lose any more time in highlighting the Easter eggs that have come my way this season. During my early days as a student in London, I was befriended by a girl about town; her tastes were rather more sophisticated than a country girl up from Cornwall (my travels to exotic climes and years as an au pair in Switzerland notwithstanding). One of the stylish shops she introduced me to was Thorntons in Marylebone High Street, an area full of upmarket independent retailers not far from our place of study. As students, we couldn’t really afford the extravagant prices charged back then, but we would occasionally treat ourselves to just one Viennese or Champagne truffle each from their Continental range. Sometimes, we got lucky and were able to purchase a big slab of their milk chocolate at a bargain price – milk chocolate that for some reason had not made it through the quality checks. I was in heaven. Thorntons has moved on since then and is now a well known high street brand. I too have moved on in my chocolate journey since those heady days, but the fondness for Thorntons remains. This flight of nostalgia was brought on when I was sent a large Thorntons Continental Luxury Easter Egg to review. 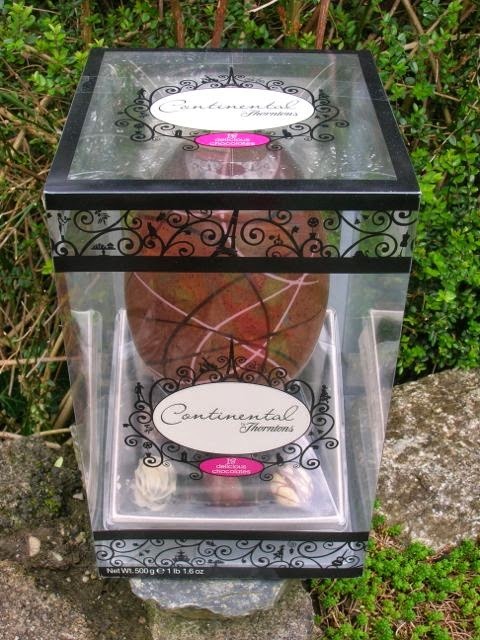 The egg itself was huge and it came with a box of 18 classic chocolates from the Continental range. The box design was elegant and I was really taken by the impressionistic, slightly retro, spirograph-inspired design on the egg itself. On opening the box, a rush of cocoa aromas emerged that I found to be quite intoxicating; this is by no means found with all chocolate. The egg is rich and creamy with a slight astringent note that gives it a fully rounded chocolatey flavour. These days, I prefer my chocolates with less sugar rather than more and these Continentals do err towards the sweet side, but I enjoyed them nevertheless. I was pleased to see that my old friend, the Viennese truffle was represented and although the old champagne truffle I remembered was not, there was a ganache au marc de champagne, which was very nice indeed and left a pleasantly warm glow as it travelled from mouth to tummy. The other classic I remembered of old was the Diplomat, which was another firm favourite – it seems we may have treated ourselves rather more than I at first remembered! Cappuccino truffles were never a favourite as I’m not a fan of coffee flavoured chocolates and there were two of these in the box. Luckily CT is rather partial, so he did get a bit of a look in. In fact the egg, combined with the chocolates kept us both happy for several days, as it should weighing in at 500g. Normally £24.99, I’ve just noticed it’s currently up for an absolute bargain at £14.99. Making my own Easter eggs has always struck me as a little daunting and although every year I had plans to try, I never actually managed it. However, this year I was sent an Easter egg making kit from Stay in Devon, so the proverbial bull just had to be taken by the horns. So I did. The kit is really meant for children, so how scary could it be? It came with a chocolate mould for two eggs and two 150g bags of milk chocolate buttons from Choconchoc. It also came in a sturdy box with instructions, some sweets to make one’s very own egg heads and a paper chef’s hat. I was a little surprised at the quality of chocolate which tasted good and had 33.5% cocoa solids. I was pleased that just because the kit was aimed at children, the little ones were not being fobbed off with low quality goods. There is plenty of Easter fun to be had on the website including a photo gallery of the eggs being made or eaten and an Easter egg hunt with a £500 prize up for grabs. The instructions were a little basic. They didn’t tell you how much chocolate to melt for starters. However, it worked and I successfully made two shiny Easter eggs. The trick it seems is to polish the moulds with a little flavourless oil – I used sunflower oil. This not only makes the eggs easier to get out of the moulds, but helps to give them a nice shine too. Basically, it was a process of melting the chocolate and adding it in layers. I swirled the chocolate around the mould, using a teaspoon to ensure all surfaces were covered, then poured the excess back into the bowl of melted chocolate, allowing it to set before doing the same again. My kitchen was cold, so it only took a few minutes before I was able to repeat the process, which I did twice more. As per the instructions, I dutifully decorated the eggs with the sweets provided. My egg heads looked like something from a B movie sic-fi romp, but hey, everything is post modern these days. You may remember, my recent post about the Godiva competition and that I was too late to enter my Amaretto chocolate pots. Well I was also unable to take up the invite to go up to London for the award celebrations. For those interested, the finalists and their entries can be seen in this video clip. As some sort of compensation, Godiva very kindly sent me some of their chocolate: some Easter bunnies and some chocolate pops – aka mini Easter Eggs. The eggs were wrapped in colourful silver paper and looked so good I kept them in a bowl on the sideboard for several days before tucking into them. Each colour egg had a different flavoured ganache, mousse or praline filling and was covered with either dark, milk or white chocolate, with a layer of the same running down the middle. There were nine different colours in all, including an orange covered coffee ganache, a gold covered white chocolate ganache flavoured with vanilla, a yellow white chocolate ganache flavoured with lemon and covered in dark chocolate and an 85% dark chocolate ganache. My favourites were the pink milk chocolate speculoos mousse, the red dark chocolate raspberry mousse and the green dark chocolate praline with biscuits. The layer of chocolate running down the middle broke up the filling in an unexpected way adding extra texture and interest. We both liked the pops. Sadly, the bunnies arrived in bits, having been crushed in the post, so I didn’t get to assess them in the looks department. To be fair, these are not normally something that is sent in the post as they are only available to buy in shops. The chocolate itself was of the milk variety and tasted a little of coconut. It was rather too sweet for CT or I to eat as it was however, so I am planning on using the bits in baking. To finish, I give you a bowl of Cadbury’s mini Easter eggs. Cadbury’s creme eggs I have known and loved as an Easter special ever since I can remember. You may or may not have seen the creme egg buns I made with them a few weeks ago – they were very nice. This is the first time I’ve come across them in mini form though. Cute with a higher ratio of chocolate to fondant filling than a regular creme egg, these are very tasty, if very sweet, mouthfuls. The others were completely new to me in egg form: Caramel eggs, solid Dairy Milk chocolate eggs and some I got stupidly excited about when I saw them, Daim eggs. I adore the delicious bits of crunchy Scandinavian butterscotch that permeate the chocolate and was completely addicted to Dime bars as a student. The eggs come in 89g bags which gives 8 eggs, except for the Dairy Milk where you get 93g and 9 eggs. I have Easter recipe plans for my eggs, but in the meantime I’ll give you one you will immediately want to sink your teeth into, courtesy of Dashing Dom. With thanks to Thorntons, Godiva, Stay in Devon and Cadbury’s for my mountain of eggs. I was not required to write a positive review and as always all opinions are my own. Ohh, I love the ones you made look like aliens, haha! I’m loving the chocolate eggs with the fried egg sweeties on! So random but I love it. i so wish chocolate didn’t give me a migraine! Looks like you are in chocolate heaven here with all these Easter eggs. lovely guide. lovely seeing your home made creations – v cute! Oh my! Chocolate heaven! I love your egg heads – they remind me of Janice from The Muppet Show – just need a cool hat! GREAT reviews for your favourite food group, chocolate! heheeh I didn’t get the chocolate bunnies, but I rather like your vegetarian take on road kill! I love that chocolate is full of antioxidants as well as making you happy. Life is good.